Public development banks are increasingly influential in stimulating investment in the global south and delivering the finance needed to achieve the Sustainable Development Goals. But with power comes responsibility - and there are growing concerns that PDBs risk having negative impacts on development. 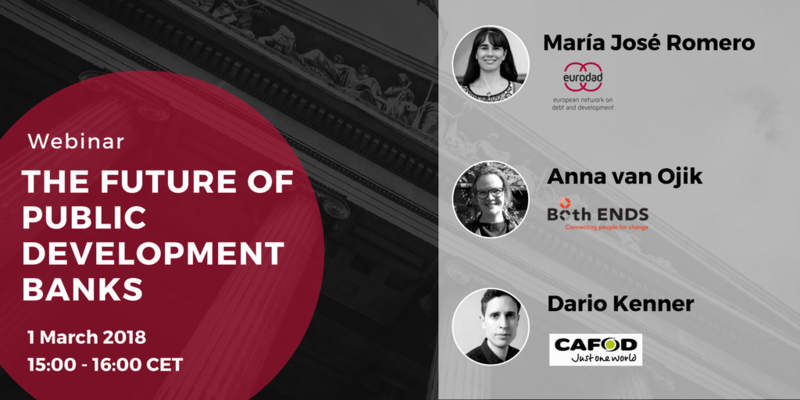 Building on recent reports by Eurodad, FERN and CAFOD, this webinar aims to broaden the debate about PDBs, and specifically about European Development Finance Institutions. It will enable CSOs and academics to share their vision for more effective PDBs and to discuss how best to influence key decision and policy makers. The session will be moderated and participants will have the opportunity to ask questions, share their perspectives and identify common challenges.